The K-9 Kore Roller and Wedge are two great pieces of canine fitness equipment. Just a simple cylinder and a pie slice, their looks are deceptive! Although small, they can pack a punch with the exercises that can be performed with them. As usual, our goal with these products is to assist or enhance function and of course, be safe! I always recommend using equipment after independent movement on land is safe, strong, and stable. The wedge may be utilized for a variety of different reasons. It is an important component in exercises with puppies beginning at the age of two-three weeks. The texture of the wedge allows puppies to experience different surfaces and encourages proper use of the digit and carpal flexors. The wedge may be placed in front of the puppies’ mom and the pups encouraged to walk up the slight incline to get to their mom to nurse. Of course, this is monitored and the puppy and wedge are placed on a soft and secure surface. Walking up the wedge will encourage movement of the hind limbs, as well as begin core strength. As the puppies progress and become more mobile, the wedge may be used to work on core strength, balance and proprioception. 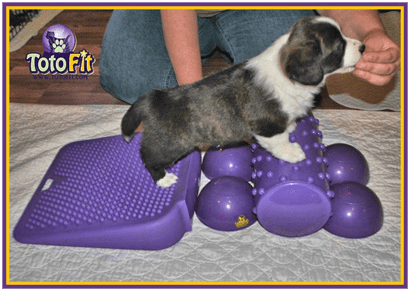 The puppy may walk up, down, and over the wedge to continue to work on balance and proprioception. The wedge may be placed in the puppy area and used as an obstacle in their random play. 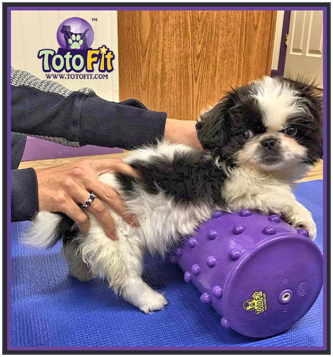 All Toto Fit equipment is lead, BPA, latex and phthalate free, so it is safe to allow puppies and all dogs to walk on and play with it — but not chew it, of course. 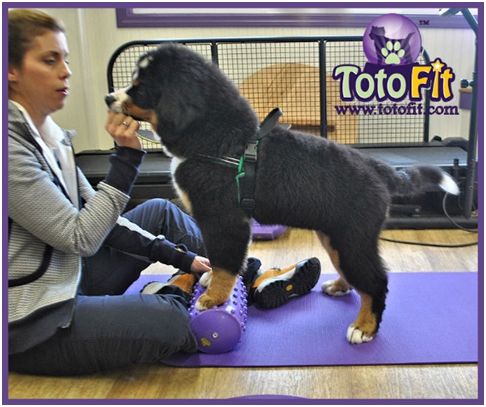 As in the photo, puppies may be encouraged to walk over a variety of Toto Fit products to improve balance and proprioception. Besides development, the wedge may be used for many directed exercises. When the dog places their hindlimbs on the wedge, with the lower part heading towards the rear working on a slight incline, the dog will place a small stretch on the hock and the hamstrings as the dog is encouraged to reach forward. The wedge may also be utilized for toy and small breeds to work on equilibrium. Standing on the wedge in a variety of directions, the dog will be able to work on balance, core strength, and stabilization. When the dog is standing on the wedge, active and passive balance exercises may be done, such as head movements and sit to stands to encourage strengthening. Ipsilateral core strengthening with smaller dogs can be done as well, by having the dog hold a stand sideways with one side of its body higher than the other. Sit to stand on the wedge is a great method to begin working on proper form. When the dog sits on the wedge, the pelvic angle will assist the contraction of the pelvic musculature in executing the stand. The dog’s pelvis will move from a caudal position in a sit to a forward tilt with the stand and the opposite from a stand to a sit. This is an excellent exercise to work on increasing pelvic control in all dogs, but in particular dogs that have lumbar weaknesses and problems with iliopsoas weaknesses. The roller is a wonderful tool and may be used in a variety of ways with adult dogs and puppies. For rehabilitation or general strengthening in puppies and small breeds, it may be used as a weight bearing tool. In the photo below, I am working on increasing the weight bearing capability of the hindlimb on this little guy. He had a hip injury as a puppy and needs to place more weight on one of his hind limbs. For more advanced exercise, safely place the forelimbs on the roller while it is stabilized and then rock it approximately a half inch to an inch back and forth. This will increase the dynamic activity of the forelimbs, hip flexors and the core. The dogs’ feet should stay in place with no shifting and its body core muscles should keep it balanced. The difficulty may be increased by placing the hind limbs on an unstable surface. The roller may also be placed under the hind limbs in a stable and secure fashion. While the forelimbs are on the floor, the hind limb and abdominals will be challenged. There will be a slight increase in weight bearing on the forelimb, as well. This activity may be challenged by moving the roller forward and backwards in a controlled fashion one half to one inch. This will focus on eccentric contractions of the iliopsoas and the abdominal region. The difficulty of this activity may be increased by placing a wedge or some other object with an unstable surface under the forelimbs. As always, the focus is on the control, form and quality of the movement. A stable core and level topline throughout each exercise is necessary to insure the muscles are worked correctly and the spine is not compromised. Difficulty can be increased by adding time and repetitions and/or varying the height or stability of the surface worked on. Get started with your very own K-9 Kore Roller or K-9 Kore Wedge today! « Extreme Canine Conditioning Exercises — They may be Possible, but are they Safe?